We are so very luck at Mayer that it is still encouraged (and allowed) that our students dress up in their Halloween costume at school on October 31st. Here, 5th grader Bergen B. created her very own bird costume complete with feathered feet. It was only apropos to take her outside and snap a photo of her holding Mayer Magnet chicken Millie Mariposa! We LOVE NeighborSpace! Thank you for the $500 donation from The Hideout's summer Veggie Bingo series! These donations allow us to continue to run the variety of green initiatives here at Oscar Mayer elementary school. Once again, NeighborSpace generously donated $375 from the weekly Veggie Bingo night held every Wednesday during the summer at The Hideout. Many, many thanks to this wonderful organization for continuing to support the Oscar Mayer Garden Project. A giant thank you to NeighborSpace for your donation of $555 from the 2015 summer of Veggie Bingo at The Hideout! Every Wednesday evening during the summer, The Hideout hosts Veggie Bingo and each week, the proceeds from bingo card sales are donated to a different community garden. Bingo winners receive veggies, honey, chocolate, t-shirts as prizes and the big winner of the evening gets a whole bag of CSA goodies!! This donation will help to buy seeds and supplies to start our many garden in the spring. Many thanks to Baker Heirloom Seed Company for the very generous donation of seeds worth $100. We went hog wild and ordered some really great sounding fruits and vegetables: Kajari Melon, Garden Berry Pepino Melon, Chinese Lantern Gigantea, Ground Cherry, Tzimbalo Melon Pear, Violetta Precoce Artichoke, Blauhilde Bean, Bennings Green Tint Scallop Squash, Purple Bumble Bee Tomato, Thai Lavender Frog Eggplant, Bull's Blood Beet, Dragon Tongue Bush Bean, Tongues of Fire Bean, Pusa Asita Black Carrot, Thai Chao Praya Eggplant, Purple Dragon Carrot. WE ARE SO EXCITED TO PLANT THESE SEEDS!! Thank you The Hideout for your generous donation of $2700 to help sustain all of our green initiatives here at Mayer. We also won a $1500 honey bee grant from The Whole Kids Foundation. It is our plan to enhance our classroom honey bee materials, purchase two bee suits and install a FlowHive next spring. Our school and neighborhood community have fully embraced both the chickens and bees living at our school. They continue to support and sustain these amazing programs by holding fundraisers and donating to the cause. Whether it be a hot chocolate sale, a Girl Scout pop cycle sale, or a lemonade/cookie stand, the parents and students of Mayer are doing their part to make sure that these amazing programs thrive. Our new 6 chicks arrived today and are happily peeping in their new brooder box! We have 2 Buff Orpingtons, 2 Plymouth Rocks and 2 Ameraucanas. All three breeds are cold hardy birds that can survive our brutal Chicago winters and also still like to lay eggs when it's cold outside. They are also known for being very docile around kids. Today, eight kids ranging from 4 years to 10 years old manhandled the 7 day old chicks with wild abandonment...it was awesome!!! The chicks will need to be moved out to their new chicken coop in about 8 weeks time. Better start building that coop!!! WOW!! Thank you, thank you, thank you to THE HIDEOUT for your amazing donation of almost $10,000!! Your very generous gift will allow us to purchase 6 chickens, build a wonderful chicken coop and bring two beehives to our school!!!! A HUGE thank you to THE WHOLE FOODS FOUNDATION and FoodCorps for awarding The Oscar Mayer Garden Project a $2000 school gardening grant!! We are so excited to start planing some amazing projects for the school: cluck, cluck and buzzz buzzz! That is all we are saying right now but stay tuned...amazing additions are coming our way!!! Thank you to HIGH MOWING ORGANIC SEEDS for donating seeds for our 2013 gardens. This year, the Oscar Mayer Garden Project had some surprises. First, we neglected to trim the trees that line Clifton Avenue and the vegetable garden was dismal. We have learned our lesson and we will always find the funds to hire a tree trimmer come spring. Secondly, the gardening company that was hired by CPS pulled up most of our perennials!!! It was heartbreaking. But, on a positive note, this year we planted giant sunflower seeds in the Montessori garden and they were spectacular!! The Montessori Garden looked fantastic and The Garden Project was awarded Honorable Mention in Mayor Daley’s 55th Annual Landscape Awards sponsored by the Chicago Department of Environment. THE HIDEOUT once again donated to The Garden Project: $1000 to help finance the yearly expenses. A GIANT thanks to the nice folks at the Hideout. What another great gardening year for Mayer Magnet! 98% of all classrooms started seeds, designed and transplanted their very own plots, tended to their plants and harvested some food. We couldn't be more proud of our student gardeners and the excitement and enthusiasm they show for learning where out food comes from. This year, Oscar Mayer Magnet School’s Garden Project won 3rd Place (Region 2 / Schools) in Mayor Daley’s 54th Annual Landscape Awards sponsored by the Chicago Department of Environment. Award winners in thirteen categories were honored during an awards ceremony November 6, 2010 at the Hyatt Regency Chicago, 151 E. Wacker Drive. “I am proud to honor such a diverse group of people representing all corners of the city; our businesses, our schools, our community groups, are all connected by the common thread of greening and beautifying Chicago. The positive impact that these gardens and landscapes have on our environment and quality of life can not be understated,” said Mayor Richard M. Daley. 3rd grader Grace Hughes was invited to the ceremony to accept the award on behalf of our school. Pictured from left to right: Suzanne Malec-McKenna, Commissioner of Environment, Oscar Mayer Magnet student Grace Hughes with her father Eric Hughes, Mayor Daley and Garden Project parent volunteer Anastasia Hinchsliff. THE HIDEOUT'S (www.hideoutchicago.com) weekly Veggie Bingo game again hosted an Oscar Mayer Garden Project evening this summer with all proceed's benefiting our gardening programs. A huge thank you for the $300 donation and also, a giant shout out to all of the Mayer parents and teachers who came out to play some bingo! A really great time was had by all. Annie's Homegrown (makers of those yummy cheese bunny crackers and organic mac and cheese) awarded Mayer with a Annie's Grant For Gardens. We will receive a cash prize of $250 to help sustain The Garden Project with materials and plants. Annie's receives thousands of requests for grant money so it is an honor to be recognized by them. Next time you are shopping for snacks, try some bunny crackers http://www.annies.com. This summer, local tavern and music venue The Hideout held a weekly Wednesday night bingo game with proceeds to benefit NeighborSpace, a local non-profit that helps community groups protect and secure their community garden or park from potential development and works in concert with many private and public partners to preserve and expand community managed open space in Chicago (http://www.neighbor-space.org/main.htm). After donating a whopping $3,445 to NeighborSpace, The Hideout decided to spread the bingo wealth and the final four weeks were divided among local farmers and/or groups. The Oscar Mayer Garden Project was the lucky recipient of the September 30th bingo bonanza and we received $231 dollars! To read more about Veggie Bingo and the upcoming Soup and Bread events at the Hideout, please visit: http://www.soupnbread.wordpress.com. A huge thank you to Martha Bayne, Hideout bartender and fantastic blogger for inventing Veggie Bingo and for thinking of Mayer's Garden Project. 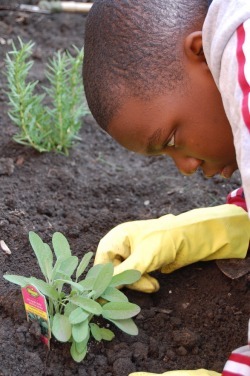 The Oscar Mayer Magnet School Garden Project was selected from more than 200 youth and community gardening programs nationwide to receive a tiller/cultivator from Mantis (http://www.mantis.com), valued at $349. Each year Mantis offers an award program for charitable and educational garden projects that enhance the quality of life in their host communities. The National Gardening Association (www.garden.org) administers the program for Mantis, and selects 25 outstanding applicants to receive Mantis tiller/cultivators. "Mantis is proud to support this terrific project," says Awards Program Coordinator, Linda Beattie. "The Oscar Mayer Garden Project was chosen because of its demonstrated commitment to using resources, creativity, and community connections to produce bountiful gardens with far-reaching benefits." Thank you to Kathleen Judge for her $150 donation. Thanks to the Pollinator Partnership (www.pollinator.org) and FlipVideo (www.theflip.com) and Aveda (http://www.aveda.com) for donating the cool video camera. Oscar Mayer Magnet School’s Garden Project was awarded an $800 grant from Greencorp. Oscar Mayer Magnet parents Anastasia Hinchsliff and Janan Asfour attended 12 hours of workshops at the Center for Green Technology to learn about garden design and in return received $800 worth of goods and services from the Greencorp experts. A HUGE thank you to THE HIDEOUT (www.hideoutchicgo.com) for your very generous donation of $2,500 for the Garden Project!! Your donation will allow us to buy the plants needed to fill our gardens for two years! Thank you so much for your support! Thank you to THE FRIENDS OF MAYER (www.friendsofmayer.org) for your $2000 donation to The Garden Project. Without your encouragement and support, we could not have started or sustained our wonderful gardening program. Oscar Mayer Magnet School’s Garden Project has been awarded 1st place in the School Category for Region 3 of the 2008 Mayor Daley’s Landscape Awards Program!! The 52nd Annual Mayor’s Landscape Awards Program is the City’s way of acknowledging the individuals, businesses, community groups, schools and other public institutions that contribute their time and energy to making our city the greenest in the nation. We are so thrilled and honored to have received this recognition! Representatives of Oscar Mayer Magnet School attended an awards ceremony with Mayor Daley on November 1st at Garfield Park Conservatory. Congratulations to all of the students, teachers and parents who contributed to making the Garden Project such a stunning success in it’s first year.